Roasted Lemon Chicken is a really easy recipe and can be made for family dinner or entertaining. This recipe uses lemons and onions, which create a juicy lemony sauce that pairs perfectly with the chicken. True confessions…I am a HUGE fan of Ina Garten aka “Barefoot Contessa”. This recipe is inspired by Ina Garten, with adaptations. As Ina says, “Roast a chicken and a man shows up!” Glamour magazine once featured this recipe as “Engagement Chicken” because ladies were making this roasted lemon chicken and getting engaged very quickly! I can’t promise you that a man will show up, but I can tell you that according to my husband Anthony, it is the very best chicken on the planet. He goes crazy when I make it for him, it reminds him of a warm home and family time. I like to use the best chicken I can find, and garlic is optional. Since Anthony does not like garlic, I have left it out, but certainly, add garlic to your heart’s content. Ina’s culinary talents are legendary, recipes are well-tested (sometimes over 25 times! ), and always delicious. Her cooking style was influenced greatly by her time living in France and the 20 years she owned a specialty food store and catering company called Barefoot Contessa in the Hamptons, NY. She has been a huge influence in my cooking for many years, as she uses easy to find ingredients and cooking equipment. In saw her speak in Costa Mesa in November 2015 at the Segerstrom Center and was so excited to be in the same room with her, I still can believe it!!! She is funny, honest, and truly jolly! I found it fascinating that she still loves to write cookbooks more than anything, she really does love Jeffrey her husband, and gets a thrill out of always learning new things in the food world. So let’s get this show on the road and assemble your ingredients. Remove and discard the chicken giblets. Pat the outside dry. Liberally salt and pepper the inside of the chicken. Cut the lemons in quarters, place 2 quarters in the chicken along with the garlic and reserve the rest of the lemons. Place the pan on top of the stove and turn the heat to medium-high. Add the wine and stir with a whisk or wooden spoon to scrape up the brown bits. Add the stock and sprinkle on the flour, stirring constantly for a minute, until the sauce thickens. Add any juices that collect under the chicken. Carve the chicken onto a platter and serve with the lemons, onions, and warm sauce. Enjoy this recipe, I promise it will become a favorite in your arsenal of cooking. Here is the link to Ina’s original recipe on Food Network. This recipe has been adapted from the original recipe. Roasted Lemon Chicken is a really easy recipe and can be made for family dinner or entertaining. Remove and discard the chicken giblets. Pat the outside dry. Liberally salt and pepper the inside of the chicken. Cut the lemons in quarters, place 2 quarters in the chicken along with the garlic and reserve the rest of the lemons. Brush the outside of the chicken with olive oil and sprinkle the chicken liberally with salt and pepper. Place the chicken in a small (11 by 14-inch) roasting pan. (If the pan is too large, the onions will burn.) 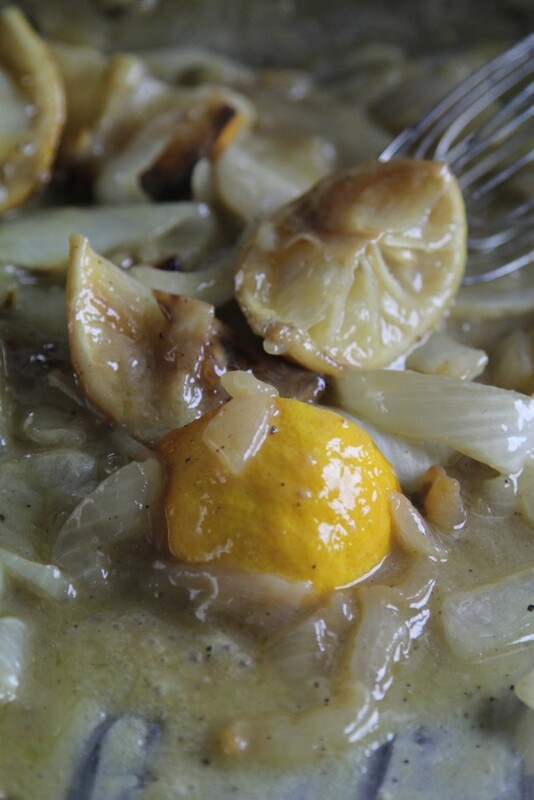 Place the reserved lemons and the sliced onions in a large bowl and toss with 2 tablespoons of olive oil, 1 teaspoon of salt, and 1/2 teaspoon of pepper. Pour the mixture around the chicken in the pan. This was surprisingly simple to make. The sauce was a bonus and the chicken was very tender, which is a miracle because I often overcook chicken. Love the brightness the lemon added. The only way my family would have liked this more is if I had made two chickens. I wonder how it would be the next day for lunch.